The moment my eyes open in the morning, I am ready to eat. If I wake up early, I can’t go back to sleep because my stomach starts to growl and gently pulls me to the fridge. But usually I don’t mind since I have a little love affair with breakfast. My love for all things breakfast was sadly smashed to smitherens in Thailand where often Thais just eat the same thing they had for dinner for breakfast. They do have a sort of rice porridge called jok, but it’s a bit too intense for breakfast for me. Breakfast was the only meal I would make for myself in Thailand. Usually it was “whole-wheat bread” that really looked like white bread with a slight tan with over-priced jam or peanut butter, or soupy yogurt with museli. Of course eating amazing, cheap Thai food the rest of the day made up for the non-existent breakfast choices. So I was content. And when I did eat breakfast on the street in Thailand, I would usually get khay jiao, a Thai-Style Omelette. It was my favorite Thai “breakfast”. 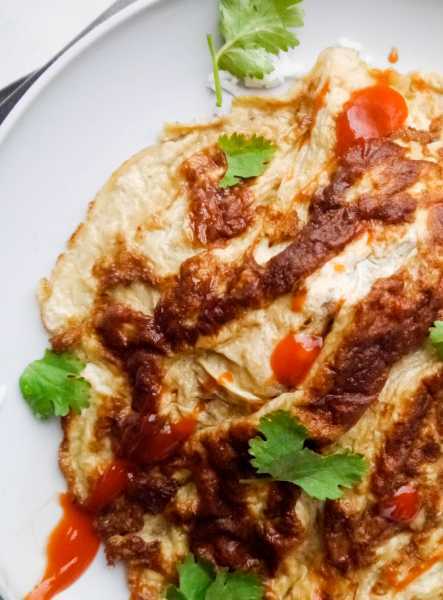 Khay jiao isn’t much like an American omelette, it’s much better. 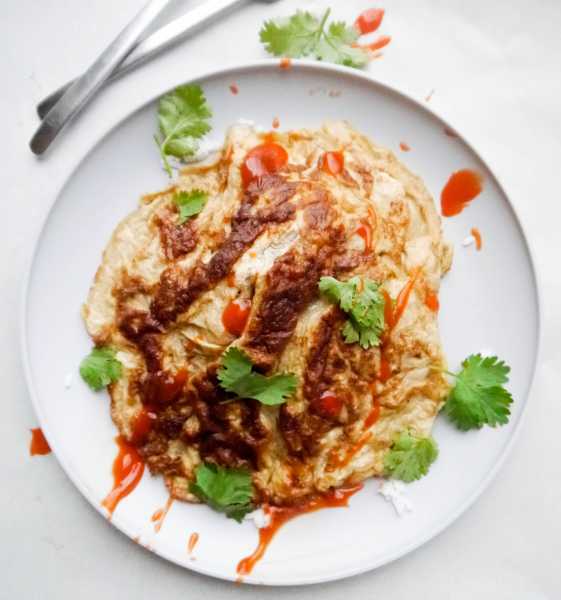 Instead of folding it over, the perfectly browned, fluffy omelette is served open-faced like a frittata over a round hill of rice. It comes with Thai chili sauce in a little bowl or in a bottle on the table. But of course khay jiao isn’t considered a breakfast item in Thailand and can be eaten at any time of the day. Now in Austin, I make it for our fam, the kids loooovee it, for dinner at least once a week. In Thailand usually it just has some ground pork in it, but we like to put garlic, onions, sausage, spinach, mushrooms, broccoli…aka, whatever meat and veggies are in our fridge that we want to use up. But what always goes in it are eggs, fish sauce, white pepper powder, and my secret ingredient, a little dark sweet Thai soy sauce. 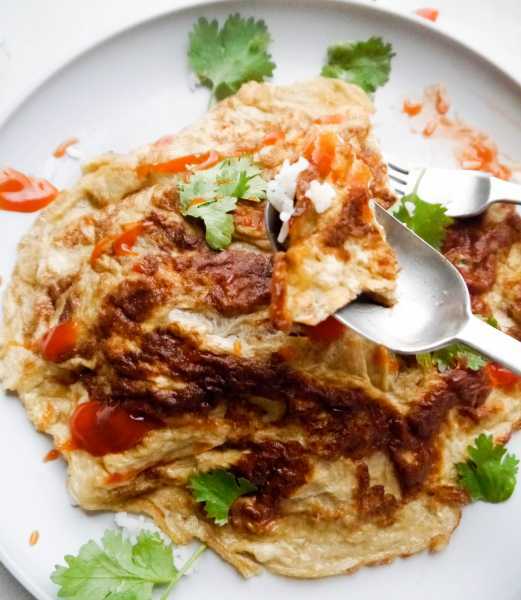 I saw a khay jiao street vendor put that in her omelette once, it was one of the best Thai omelettes I’ve had, so I decided to use her trick to balance the flavors. Oh, and there is no cheese involved. Thais don’t use dairy in their cooking, and my Thai Hubby is lactose-intolerant anyways, so we don’t add cheese. But if you want to make it American-style, throw some cheese on top. 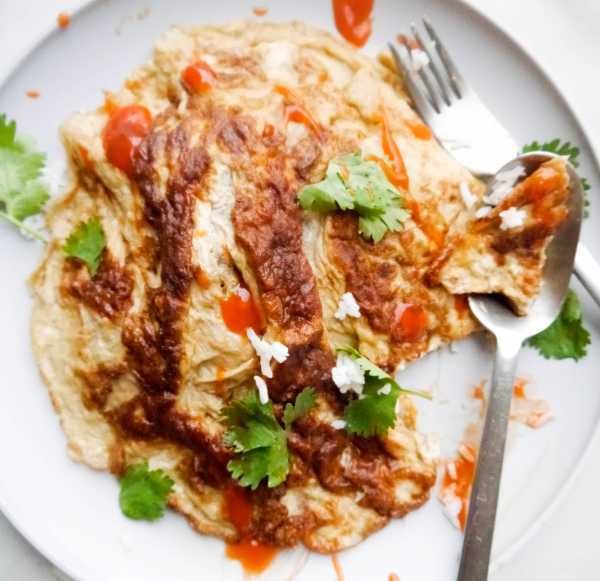 Thais will think you are weird, but it’s ok.
And check out our 1-Minute How to Make a Thai-Style Omelette video!! Woohoo! And then try it out for breakfast, lunch or dinner, and tell me what you think! Put the cooking oil of your choice into your wok or pan. Get the pan hot and steaming. Crack the eggs into a medium-sized bowl. Add fish sauce, dark soy sauce, and pepper to your liking*. Wisk, wisk, wisk until you see bubbles start to form in the egg mixture. Add the rest of your ingredients of choice, and wisk again until combined. If you want a fluffy, lightly-browned omelette, make sure your pan is smoking hot before you put in the egg mixture. You can test it by dropping a tiny bit of the egg mixture in the pan and see if it sizzles. Move the pan around some to evenly distribute the mixture so the middle gets cooked. If you lift up the omelette and notice it's browning too fast, turn down the heat some to make sure the omelette doesn't burn before the middle cooks. Once it starts to solidify, get two spatulas. Put one on each side of the omelette, and try to flip at the same time. *If your omelette just broke apart during the flipping, don't worry. It takes some practice. Happens to me all the time, and they still taste delicious. The key to keeping the eggs together is making sure the center is almost cooked before flipping. Cook the other side for a few minutes. Peek under and once it's browned, slide off the pan onto a plate. Sprinkle with cilantro and serve with your favorite chili sauce or Thai chili sauce and rice. Enjoy! Feel free to use more eggs, just adjust the fish sauce, dark soy sauce and white pepper accordingly. If you like more of a savory taste, use more fish sauce. If you don't, use less. I’m simply enchanted and can’t get enough right now!